The mother of Leonidas, while pregnant dreamt that she was going to give birth to a lion, thus when her son was born he received the name Leonidas; Lion. He had two older brothers, plus a younger brother. Leonidas would become king of Sparta, the 17th of the Agiad line. He succeeded, probably in 490 B.C., his half-brother was Kleomenes I, whose daughter Gorgo would become his wife. He may infact have been involved in a plot to kill his half-brother King Kleomenes I, who had been convicted of bribing the Oracle of Delphi into proclaiming that the EurypontidKing Demaratus was an illigitimate child and therefor not entitled to be king. In dishouner he fled and was trying to stir up trouble against Sparta to try and reclaim his kingship. On hearing this, Sparta asked him to return as king, which he promptly did only to find 'his kindred imprisoned him'. While in prison Kleomenes I ask the helot jailer for a knife and 'beginning at his legs, he horribly disfigured himself, cutting gashes in his flesh, along his legs, thighs, hips, and loins, until at last he reached his belly, to which he likewise began to gash, whereupon in a little time he died' . This far out story of self mutilation is slightly reiminiscent of a television series called Black Adder, when asked what had happend to a certain person his reply was 'he accidently brutally cut his head off while shaving'. It seems more likely that his half brother Leonidas ordered his death and claimed the throne for himself, probably with the blessing of the ephors. At the isthmus of Corinth it was voted that the King of Sparta would lead the allied forces of Greece at Thermopylae against the barbarians. This is only the second time in history, Hellas united under one military commmander, the only other previous time was under Agamemnon for the invasion of Troy. Leonidas may have been chosen out of the two kings for the roll he played in his half-brothers murder. The 'sacrificial lamb' being led away from Sparta as a sacrifice to clean Sparta of the evil it allowed in the murder of his brother. Though it has to be said that the Agiad line of kingship was the stronger of the two, which Leonidas represented. 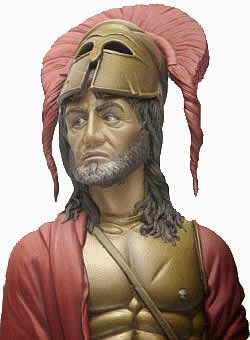 We must also consider that due to Leonidas' uncle, King Kleomenes' part in dismissing the Eurypontid Spartan King Demaratus, and his subsequent defection to Persia. That Sparta believed that Demaratus needed some kind of revenge for the gods to be satisfied, and that Leonidas' who inherited kingship from his uncle, was the 'lion' to be sacrificed for it. Leonidas was the youngest of three children: Dorieus, Cleomenes (or Kleomenes) and Leonidas, so he was never expected to rise to the throne, therefore he took part in theagoge, the unique training of Sparta usually spared from the royal heirs. Dorieus was born after Cleomenes but was fully legitimate, Cleomenes dealt with him and gained the throne. He ruled successfully for many years before going mad and mutilating himself to death. Thus Leonidas beacame king much to his suprise. He didn't last long. With the impending attack of Xerxes force on the peloponese, Leonidas consulted the oracle and got the answer: 'either a king dies at the walls of Thermoplyae or Sparta falls' a no-brainer really. Leonidas couldn't take all his army as the ephors refused to allow him to interrupt Carniea, a festival to Apollo. Leonidas held out for three days at thrmopylae with 300 Spartans and a collection of men from thespia, Athens, thebes and however felt like helping numbering about 7000 in all. In the morning of the second day, Leonidas sent all but the Thebans home, but the Thespians stayed. He told them (as features in the feature film) to 'eat a full and hearty breakfast, for tonight we dine in Hades'. According to the ancient Greek historian Herodotus in The History of Herodotus, Leonidas was in command of the now famous 300 Spartans who were sent, in advance of the main Spartan body of troops, to engage the Persian horde in order to arrest and defeat its intended invasion of Greece. The Spartan troops of only 300 men at arms were augmented by troops sent by several other city-states who seemed determined to engage the Persian forces, but Leonidas had picked up and accompanied the delegation of troops from Thebes, because the Thebans had already hinted that they might desert the Greek alliance and unite themselves with the Persians. In order to shore up the flagging hopes of their allies, therefore, the Spartan advance guard made camp in a narrow mountain pass at a place now made famous by the battle fought there — Thermopylae (the Hot Gates). Leonidas (Greek: Λεωνίδας - "Lion's son", "Lion-like") was a king of Sparta, the 17th of the Agiad line, one of the sons of King Anaxandridas II of Sparta, who was believed to be a descendant of Heracles. He succeeded his half-brother Cleomenes I, probably in 489 or 488 BC, and was married to Cleomenes' daughter, Gorgo. His name was raised to a heroic and legendary status as a result of the events in the Battle of Thermopylae. In 480 the ephors sent Leonidas with the 300 men of an all-sire unit (soldiers who had sons to carry on their bloodline) and 6700 allies to hold the pass of Thermopylae against the hundreds of thousands of Persian soldiers who had invaded from the north of Greece under Xerxes. Contemporary accounts claim Leonidas took his small personal fighting unit because Spartan religious customs forbade sending an army at that time of year. In addition, he was deliberately going to his doom: an oracle had foretold that Sparta could be saved only by the death of one of its kings, one of the lineage of Hercules. Instead it seems likely that the ephors supported the plan half-heartedly due to the festival of Carneia and their policy of concentrating the Greek forces at the Isthmus of Corinth. According to Herodotus, Leonidas' wife Gorgo asked him how she could aid his mission. He responded "marry a good man, bear good children, and live a good life." Several episodes demonstrate the laconic matter-of-fact bravery that famed Leonidas and the Spartans. On the first day of the siege Xerxes demanded the Greeks surrender their arms. Leonidas replied "Come and get them" ("Molon Labe"). This phrase has been re-used by generals and politicians throughout history and often repeated in popular culture. On the third day, the king exhorted his men to eat a hearty breakfast, because that night they would dine in Hades. Leonidas' men repulsed the frontal attacks of the Persians for the first two days, but when the Malian Ephialtes led the Persian general Hydarnes by a mountain track to the rear of the Greeks, Leonidas divided his army. The King himself remained in the pass with his 300 Spartans and 400 Thebans, along with 700 Thespians who refused to leave. Leonidas' intent was to delay the Persians, sacrificing himself and his men. The little Greek force, attacked from both sides, was cut down to a man except for the Thebans, who surrendered. One theory is that Leonidas sent the remainder of his men home to preserve troops for future battles. The soldiers who stayed behind were to protect their escape from the Persian cavalry. Leonidas fell in the thickest of the fight, but the Spartans retrieved his body and protected it until their final fall to enemy arrows. Herodotus says that Leonidas' head was cut off by Xerxes' order and his body crucified, due to his alleged hatred towards the Persian King. This was considered sacrilege towards Leonidas, and unusual action on Xerxes' part. The reason why Leonidas appeared with only a token force was that Sparta was at that time celebrating a religious festival; the reason why the other Greek forces were so scanty was that their cities were celebrating their Olympic games. Neither Sparta, famous for the quality of her fighting men, nor her allies thought that the battle of Thermopylae would be engaged as soon as it was, so the matter stood and there was nothing to be done about it: The Greek forces were hopelessly outnumbered, the Persian forces were upon them and in command of the pass through which they were penetrating the country, and there was Leonidas with his 300 Spartans camped in front of the enemy's first wave. Xerxes, the tyrannical ruler of the Persians and their huge conglomerate of allies, was — like many tyrants of his time and later — an unstable and arrogant person. Earlier in the war, having enthroned himself upon a vantage point overlooking his entire war host, he had alternately laughed at the earthly military might he saw displayed before him and then wept at their mortal mutability and evanescence. At any rate, Xerxes the tyrant was resolved to tolerate no insolence from the effete and intellectual Greeks who called him a barbarian, and the appearance of a mere 300 Spartans to engage his host in hand-to-hand combat must have seemed insolent in the extreme. Xerxes was at the same time angered and intrigued by these men called Spartans, so he had the Greek ramparts scouted out. On the day that Xerxes sent his scout to reconnoiter the Greek camp, the Spartans had been assigned as perimeter guards outside the camp's ramparts. There, Xerxes' scout saw them, counted them, and then returned to report to his master what he had seen. And this is what the Persian scout saw at the place of the Hot Gates so long ago: He saw the Spartan warriors engaged in oiling their bodies and dressing their long hair outside the ramparts of Thermopylae. He saw others of the Spartans exercising at gymnastics and swordplay and general forms of leisure activity. He saw the Spartan warriors sunning themselves. And he saw that the Spartans did not seem to consider his presence worthy of much notice. When Xerxes heard his scout's report, so says Herodotus, the king found it laughable that the Spartans were engaging in such antics when they were, under his sway, in doubt of present peril. The Spartans were after all in a fix, and it was a fix of Xerxes' making. But then Xerxes called in a man named Demaratus who, having been deposed from a joint-kingship of Sparta, had become a turncoat and allied himself personally to Persia; hence, to Xerxes. And after the king recounted his scout's report on the activity of the Spartans, Demaratus explained to Xerxes: This is the way Spartans prepare to go into battle and almost certain death. They exercise, oil their bodies, and dress their hair. They go into battle shining. Demaratus then warned Xerxes that the contingent of Spartans sent out to engage his vast armies was but a sample of Sparta's military enterprise, and he advised the king to attack and conquer Sparta herself, since Sparta was herself so arrogant and timocratic that no other nation would care to aid her. But Xerxes, being ignorant, ignored Demaratus' advice. Xerxes, for whatever reason, permitted the Spartans and their allies a four-day recess from the rigors of battle, but on the fifth day he attacked, ordering his Medes and Cissians to capture the Spartans and bring them as captives to his camp. The Persians suffered horrendous losses in their offensive because the Greek allies fought so courageously in the narrow defile, employing their long battle lances to great effect. Xerxes then sent in his crack troops (his "Immortals") against the Greeks, who proved the "Immortals" to be inaptly named by killing so many of them. Thus the Persians and the Greeks fought for three days in the Hot Gates, and the Greeks grimly refused to concede defeat. But the next day a traitor to the Greeks, a person named Ephialtes, came and whispered in the king's ear. And again Xerxes laughed. Xerxes laughed because Ephialtes told him of a secret passage through the mountain, which would bring the Persian troops down behind the Spartan ramparts. So that night Xerxes sent his "Immortals" on their way to attack the Greeks from the rear while another wave of his troops would accost them from the front. As the "Immortals" ascended the mountain, they encountered a contingent of Greeks (Phocians) who were stationed in the Persian line of march. The Phocians fled up the mountain; the Persians advanced down the mountain to fall upon Leonidas and his Spartans as the new day dawned. So as false dawn appeared, the Greeks at Thermopylae held a war council, where some of the allies voted to stay and fight and some voted to flee. It is said that Leonidas himself ordered the allies to vacate the Spartan ranks, but that the Spartans themselves had no intention of ducking an opportunity to fight. But Leonidas did permit the Thespians to stay and fight alongside him because they wanted to, and he made the Thebans stay and fight because they certainly did not want to. And so most of the allies left; the Spartans remained; and the day came on. The beleaguered Greek force of Spartans, Thespians, and their hostage Thebans were now of course aware that the Persians had them bottled up in the place of the Hot Gates, and the Greek scouts coming in from the heights confirmed the case. Thus it was that, once the troops engaged on this fatal day, the Spartans sallied forth from their ramparts and flew in the face of the Persian forces ascending in the narrow pathway. By this time, the Greeks had shivered their battle lances and were fighting with swords, battle-axes, daggers, bare hands, and teeth. Theirs was the heroism and desperation of doomed men as they gathered back to back on a hillock in the pass where the Persian bowmen inundated them with flight upon flight of heavy war arrows. Immediately prior to the day's engagement, a Trachinian scout had told Dieneces, a Spartan swordsman, that the barbarians were so many that their arrow-flights would darken the sun. Dieneces replied: "These are excellent tidings. If the Medes darken the sun, we shall have our fight in the shade." By the time the last of the Spartans had retreated to the hillock, Leonidas had been killed in action, and so had Xerxes' two brothers. Apparently the Spartans carried Leonidas' body with them to the hill, where they all went down in a shambles together. Thus the three hundred Spartans perished at Thermopylae, and with them fell their faithful Thespians. Shortly before the last of the fighting Greeks fell, the Thebans had tried to surrender to the frustrated and enraged Persian front line, who executed the Thebans as they tried to give themselves up. Xerxes did permit most of the remaining Thebans to surrender to his tender mercies, whereupon he branded their bodies with the royal mark, thereby granting them perpetual infamy. As for Xerxes' capacity for tolerance and the Platonic concept of international law, it seems to have been null and void. The tyrant was so confounded by the manly conduct of Leonidas that Xerxes searched out his body from the piled dead, severed the head from the lifeless corpse, and caused the trunk to be nailed to a wooden cross. And the rest, as we say, is history. There are many stories of men who for one reason or another survived the Battle of Thermopylae; their lives and the manner of their deaths await the curious reader.